Now that spring is here, we can go outdoors for extended periods of time. This means playtime at the park: slides, climbing, throwing frisbees. What could be better? How about tossing an Aerobie around? 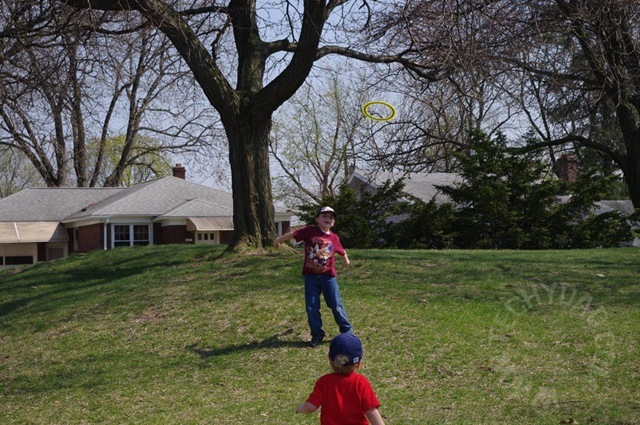 You see, NHL and JSL haven’t quite gotten the knack of throwing a frisbee. NHL’s throws tend to not travel far and JSL’s barely leave the ground. So, while we do have fun, there isn’t any distance involved. 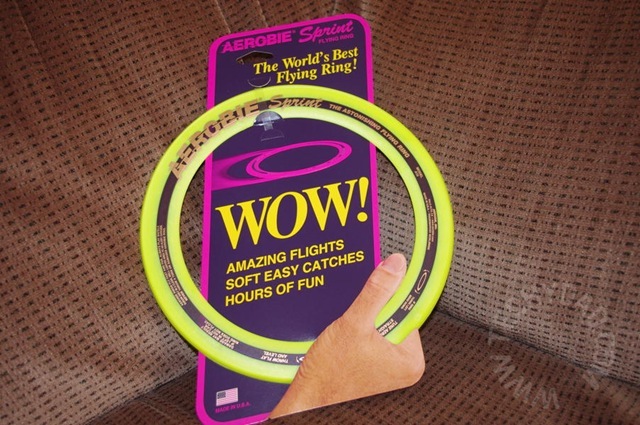 Enter the Aerobie Sprint flying ring. 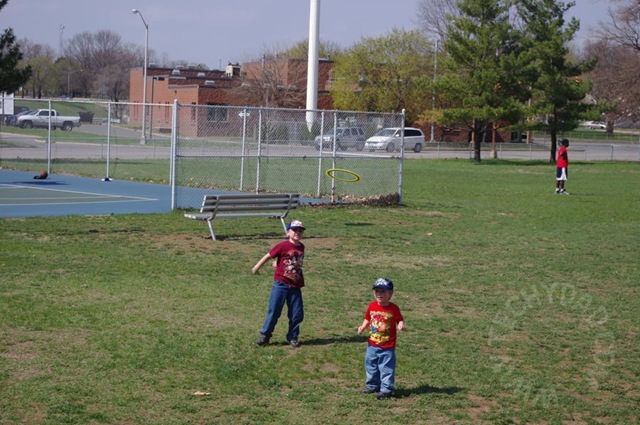 The minute the boys saw the flying ring, they wanted to try it out. I had them wait until we went to the park. Good thing too, because that disc can really fly! NHL was able to send it quite some distance. I didn’t measure, but I’d guess his throws easily topped 30 feet. 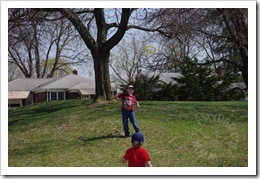 JSL had more trouble, but he also had a few successful throws. His only went about 10 feet or so, but I’d call that impressive for an almost-four year old. As for me? I got some seriously far throws in as well. This is definitely something you’ll want to play with where there’s plenty of room. At one point, NHL threw the ring towards me when we were too close to the edge of the park and it almost went into the road. After that, I made sure all throws were directed into the park and not outside of it. We all loved playing with the Aerobie and it definitely attracted attention. 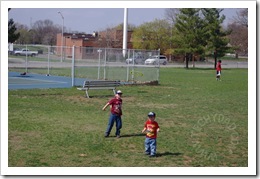 Before long, two other kids in the park joined our game of catch. I’d definitely recommend this for anyone with kids (or even just adults) and a large amount of land to toss the ring across. 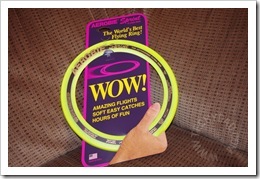 Thanks to Family Review Network & Aerobie Sprint, one lucky winner will receive an Aerobie Sprint flying ring. To enter, simply leave a comment below answering this question: What activity do you and/or your children like doing best in your local park or playground? To enter, please follow the rules above within the comment section. Contest starts today, May 3rd and ends at Noon EST on May 17th, 2011. You do not have to be a blogger to enter, but must leave a valid e-mail address for me to contact you for mailing address once the giveaway is over. I will select the winner using random.org and contact you via e-mail. You will have 48 hours to claim the prize. If there is no response, another winner will be selected. Open to U.S. and Canada residents only. Disclaimer: This post was written for Family Review Network & Aerobie Sprint who provided the complimentary product for review in exchange for my honest opinions. Thanks for the contest! 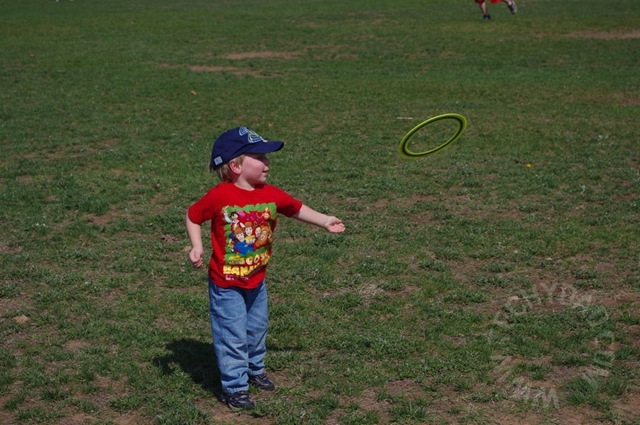 My 4-year-old would love it, and he needs lots of practice throwing and catching. Right now, his favorite activity is using his sidewalk chalk to write on anything and everything around the playground. I follow you on twitter, tweeted about your giveaway, and subscribe to your RSS feed. TimeOutDad (Renny) recently posted..Time Out for a Happy Mother’s Day! We love the slides at the playground . . . .over and over and over again! 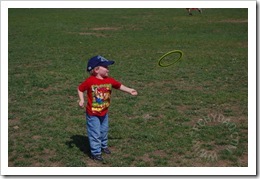 Have tried a frisbee, but my daughter would rather pick it up and run the other way. I also follow you on twitter and subscribe to your RSS feed. I tweeted about TechyDad’s giveaway. I subscribe to TechyDad’s RSS Feed. Thanks! I subscribe to your RSS feed. . . .